My trading year starts on September 1, something of a psychological decision. The academic side of me says that it’s back to school time. The contrarian side of me says that autumn is not a time of melancholy but a time when nature is at its most glorious—at least in Connecticut. (The picture, by the way, is an early autumn view of my “back forty”—don’t take that number literally--and beyond. 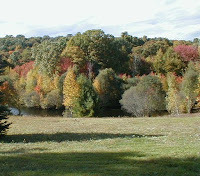 The pond and the trees on the far bank are part of the property; the rest of the color is compliments of the local water company.) And, quite frankly, I’ve never been a fan of New Year’s Eve revelry. Wall Street has thought otherwise. The major averages have dramatically underperformed in September. But for that portion of my portfolio that doesn’t give a tinker’s damn about which way the markets move, why not start the year in September? The only downside as far as I’m concerned is that there’s a shortened trading week for Labor Day and light volume days for the Jewish holidays. A new year inevitably brings with it new resolutions, for the most part broken almost as quickly as they’re made. I have only one, an impersonal grudge match as ludicrous on first blush as it is real for my psyche. I want to beat Goldman Sachs. I really, really want to beat Goldman Sachs! Here’s the benchmark, and it’s admittedly very high. Perhaps yet another manifestation of the Icarus complex, but I consider it more a stretch than a giddy flight. A Zero Hedge post (June 23) about GS’s risk exposure prompted me to do a very rough back of the envelope calculation of GS’s 2008 mathematical expectancy. [Mathematical expectancy is the (percentage of wins * average winning trade) – (percentage of losses * average losing trade).] I came out with the magic figure of 2.37. This number may be sheer fiction, but it’s the number I have adopted as the benchmark for my 2009-2010 intraday trading. I will not factor in commissions since I certainly don’t want to start out behind the eight ball. I may or may not keep you posted on my progress. Silence doesn’t necessarily mean failure. I was taught (erroneously, I now believe, but nonetheless deeply ingrained) not to toot my own horn. Dow 1937-38, a portent for the future? For anyone who likes chart overlays Don Fishback has a chart comparing the Dow between 1921 and 1938 to the Nasdaq starting in 1992. Let me elaborate a bit on the subsequent performance of the Dow. Its bottoming close in 1938 was 98.95 (3/31), it then rallied, consolidated in August, drifted below the August lows in September, and rallied to a closing high for the year of 158.41 on November 12. Alas, 1939 through 1941 never saw a breakthrough to new highs. On April 30, 1942, the DJIA dipped just below the 1938 low before beginning its wartime rally. Although the short-term prospects may be bright if history repeats itself, let's hope we don't end up treading water for four years. I have always been fond of the pre-Socratics. Perhaps because, since we have only fragments, we can extrapolate in whatever direction suits our fancy. Perhaps because virtually all of them worked on the frontiers of both fledgling science and fledgling philosophy and thus tended to be bold. Heraclitus “the obscure” was one of the most profound. Some of the recorded fragments are well known, such as “The path up and down is one and the same.” It’s a cheap shot to say that Heraclitus never experienced the financial markets where the path up is radically different from the path down. He was “testing” the concept of the unity of opposites both scientifically and philosophically. So what’s the point of this rumination? Or, better, what sent me back to Heraclitus? An important cautionary note from one of the early quants, best known to people outside the financial world as the man who beat the dealer in blackjack. “Here are some of the things we learned about building successful quantitative models in finance. Unlike blackjack and gambling games, you only have one history from which to use data (call this the Heraclitus principle: you can never invest in the same market twice). This leads to estimates rather than precise conclusions.”(“A Perspective on Quantitative Finance: Models for Beating the Market” by Ed Thorp, from The Best of Wilmott, vol. 1 [Wiley, 2004], p. 36) And, Heraclitus would add, the potential to be blindsided by the unexpected. Yesterday on Bloomberg.com there was a fascinating chart overlaying the S&P 500 since 1990 on the Nikkei 225 since 1980. The caption read, "U.S. stocks are behaving like Japanese ones in the 1990s, meaning the Standard & Poor's 500 Index may return 40 percent in the next year, according to analysts at Bank of America." Click on the "GRAPHIC" tab for the chart. and Saxo Bank in Denmark. Emanuel Derman’s My Life as a Quant: Reflections on Physics and Finance (Wiley, 2004) is one of the most engrossing books I’ve read in a long time. Derman, a South African who earned a Ph.D. in physics at Columbia and subsequently worked at Bell Labs (“the penal colony”), got his first Wall Street job with Goldman Sachs’s Financial Strategies Group at the end of 1985. After a brief interlude in the form of a “troubled year” at Salomon Brothers, he returned to head Goldman’s Quantitative Strategies Group, Equities Division, and eventually became head of Derivatives Analysis, Firmwide Risk as well as head of Quantitative Risk Strategies. In 2002 he said farewell to Goldman and left the Street for good. What intrigued me most about the book, however, was Derman’s account of his quant projects at Goldman. Two stand out in my mind. First, the so-called King of Denmark puts. And second, assessing firmwide derivatives risk. An equity options trader at Goldman had acquired large numbers of inexpensive put options on the Nikkei as the index was soaring. He suggested that Goldman issue a listed put on the Nikkei for dollar-denominated accounts. The suggestion in itself was formulaic: “Buy some simple, less attractive product wholesale, use financial engineering to transform it into something more appealing, and then sell it retail.” (p. 210) What made these put warrants appealing was that they offered protection against a potential weakening of the yen against the dollar. They were guaranteed exchange-rate options. The problem for the quants was: how could Goldman hedge itself against an unfavorable move in the dollar-yen exchange rate that could eat into profits? Derman outlines their answer, which naturally lies outside the bounds of this brief review. At the end of his career with Goldman, Derman’s primary mission as head of the Derivatives Analysis group was to make sure that the billions of dollars of exotic or illiquid derivatives were being appropriately marked to model. The problem was that “you know that the model you are using is both naïve and wrong—the only question is how naïve and how wrong.” (p. 259) Faced with uncertainty, Derman “assumed that the future could be one of several foreseeable worlds, and that there was consequently a range of possible values one could legitimately assign to the option.” The risk team compared the desk’s mark-to-model value with the range of many-worlds values. If the desk’s mark fell inside this range it was allowed. “Furthermore, since there is a range of plausible values, we recommended that Goldman hold in reserve an amount equal to the average mismatch between the range of plausible values and the desk’s actual mark.” (p. 260) Of course, I don’t know whether this was Goldman’s risk management policy when the credit markets imploded and whether, if it was, it served them well. I doubt that a financial meltdown was one of the foreseeable worlds. One of the benefits of reviewing financial books is that the process can serve as a personal sounding board. I sometimes listen to myself saying “that lacks imagination,” “that’s at best a C+,” “surely you can fly higher than that.” And, as I think through my gut reactions, I realize that I’m something of an intellectual Icarus. When I undertake a challenging project I want to get as close to the sun as possible without crashing and burning. If I don’t feel the heat of the sun’s rays, I tend to throw myself into the sea. (Note that in my version the sun in no way causes my death; I commit intellectual suicide.) Well, that’s not good, and I’m working on lowering expectations. Sometimes for a classic academic overachiever a B+ has to be good enough. My version of the Icarus complex is idiosyncratic, though it reflects the general principle that the greater the gap between an idealized goal and reality, the greater the likelihood of failure. On one level this is painfully obvious. A trader or investor has a much better chance of achieving an annualized rate of return of 5% than 50%. But how many people set such a modest goal for themselves? It hardly seems worth the effort. The trick is to set a goal that requires stretching, not soaring. Though after years of Yoga exercises with a body as inflexible as it ever was, stretching and soaring sometimes don’t seem all that different. But the intellectual metaphor can still remain intact. It means setting a goal that is well within the Bell curve of possibilities, a goal that provides a constant source of challenge and, alas, frustration as well. But, pursued properly, it also means never getting anywhere close to the risk of ruin. Stay tuned. I have a set a challenging goal for myself. Relative strength investing is a popular strategy—buy high and sell higher or, as Livermore put it, “stocks are never too high for you to begin buying or too low to begin selling.” In Smarter Investing in Any Economy: The Definitive Guide to Relative Strength Investing (W&A Publishing, 2008), Michael J. Carr takes the reader on a journey from various relative strength calculations through backtesting to a comprehensive trading plan. I should confess up front that I’m ambivalent about relative strength investing, so the author was not preaching to the choir. As its name implies, relative strength (RS) is a comparative measure. For instance, it can be used to rank the components of the S&P 500 in terms of performance over some fixed period of time. But it’s not a measure with a single formula; in this respect it differs from, say, the 20-day simple moving average of a stock’s price. There are, Carr claims, at least a dozen currently accepted methods of calculating RS—all incredibly simple mathematically and easy to define in popular trading software programs. For instance, he describes and provides the formulas for such RS techniques as normalized rate of change, ratio of prices, back- and front-weighted rate of change, price/moving average ratios, averaging different time periods, and momentum of RS. With basic charting software only junior high math is required. In backtesting RS techniques Carr uses the 33 Fidelity Select Sector Funds; the test period is January 1, 1990 through December 31, 2007. He provides detailed results for long-only systems, the upshot being that every RS strategy outperformed buy and hold but that even the optimized strategy that traded only a single fund at a time with a pretty tight initial and trailing stop had a maximum drawdown of over 42%. That can be gut-wrenching for the average investor. So comes the Sir Galahad for every strategy with an edge—risk management. Carr’s suggestions aren’t original, but they help make RS a more tradable concept. He adds three key risk management ingredients to the final system—trading the equity curve, diversification, and volatility-based trailing stop losses. He also suggests some screens for fundamentals to improve the outcome. And he sent me, the RS skeptic, back to the drawing board. That’s the power of the book. I’ve toyed with formulas defining relative strength breakouts compared to the moving average of a benchmark index. And for some perverse reason I then put them on the back burner. But Carr has convinced me to hone the strategy and follow it for a fraction of my portfolio. I may have an aversion to the greater fool theory, but done wisely there’s money to be made by going with the flow--as long as the flow doesn’t all of a sudden become a waterfall. If I’m richer next year than I am today, I will have this book in part to thank. A passage in Nassim Taleb’s Dynamic Hedging (Wiley, 1997) recalled a story I had all but forgotten. In his Politics (1259a) Aristotle recounts the anecdote of Thales of Miletus. Here I’m quoting from the Benjamin Jowett translation. Thales “was reproached for his poverty, which was supposed to show that philosophy was of no use. According to the story, he knew by his skill in the stars while it was yet winter that there would be a great harvest in olives in the coming year; so, having a little money, he gave deposits for the use of all the olive-presses in Chios and Miletus, which he hired at a low price because no one bid against him. When the harvest-time came, and many were wanted all at once and of a sudden, he let them out at any rate which he pleased, and made a quantity of money. Thus he showed the world that philosophers can easily be rich if they like. . . .” From this story and another one involving a man who cornered the market in iron, Aristotle drew that conclusion that by creating a monopoly you can in effect print money. And you thought that Thales was just the guy who said that all things are made of water and who, the quintessential absent-minded professor, fell into a well while observing the stars! In Speculation as a Fine Art Dickson G. Watts sets forth six conditional trading rules. It is these rules that I will summarize in today’s post. Even though I don’t personally advocate or follow all of them, I consider Watts’s case for them intellectually challenging. 1. “It is better to ‘average up’ than to ‘average down.’” Although, Watts admits, probably four times out of five averaging down works because the trader can exit profitably on a retracement, “the fifth time, meeting with a permanently declining market, the operator loses his head and closes out, making a heavy loss—a loss so great as to bring complete demoralization, often ruin.” The better course, though one still fraught with danger, is to average up. “Buying at first moderately, and, as the market advances, adding slowly and cautiously to the ‘line’—this is a way of speculating that requires great care and watchfulness, for the market will often (probably four times out of five) react to the point of ‘average.’ Here lies the danger. Failure to close out at the point of average destroys the safety of the whole operation. Occasionally a permanently advancing market is met with and a big profit secured.” Watts here is saying that the market is mean reverting about 80% of the time and trending about 20% of the time. 2. For the speculator “buying down” is not advisable. It “requires a long purse and a strong nerve, and ruin often overtakes those who have both nerve and money.” But those “men of good judgment, who buy in times of depression to hold for a general revival of business” can be very successful investors. If you haven’t read Speculation as a Fine Art by Dickson G. Watts you’ve missed a real gem. Written in the 1880s by a successful cotton trader and president of the New York Cotton Exchange between 1878 and 1880, the pamphlet effectively disappeared until parts of it were republished in 1965 by Traders Press and then reprinted several times by Fraser Publishing. In eight pages Watts analyzes, advises, and admonishes. I’m going to spend two posts summarizing and quoting from his pamphlet, in part because I want to burn some of his ideas into my own brain. Although Watts admits that speculation and gambling have elements in common—for instance, speculation has elements of chance and gambling has elements of reason, he defines speculation as a venture based upon calculation. For those interested in learning some quant skills I highly recommend the series of 189 videos, all under 10 minutes, offered on YouTube by the bionicturtledotcom. Start on page 10, as I've directed you, and work your way forward. I have never read a Harlequin romance in my life, but the genre is obviously addictive. A whopping 32% of adult mass-market paperbacks are romances, and Harlequin dominates the field. Moreover the genre seems to be recession proof; in the last quarter of 2008 when the economy was tanking Harlequin’s profits rose by 11.2%. And why do I bring this up? Because among books on trading there are some with striking parallels to Harlequin romances. And I fall for them over and over. I know that I’m reading a “Harlequin” trading book, but the read is so easy and so seductive that, voilà, I’ve reached the end in no time at all. Have I learned anything from it? Well, can you imagine learning anything from a Harlequin romance? My most recent “Harlequin” read was Rob Booker’s Adventures of a Currency Trader: A Fable about Trading, Courage, and Doing the Right Thing (Wiley, 2007). It tracks the trials and tribulations of Harry Banes, who morphed from a file clerk and “the worst trader in the world” to a big-bucks hedge fund trader. You can probably fill in some of the plot details, though perhaps not the fairy godmother Harvey Winklestein thread. So why am I even mentioning this book? Because, believe it or not, I did have one takeaway. And that was the chapter on homework. Every trader worth his salt does homework, but this challenge was different. A hedge fund manager that Harry met thanks to the good graces of Harvey gave the wannabe an assignment: to figure out a way to take the carry trade on a retail platform. Harry barely knew what a retail platform was let alone the carry trade. But after a lot of research and mental anguish he came up with an imaginative solution, I assume a Harlequin denouement. Well, my stream of consciousness kicked in. I remembered, however vaguely, accounts of self-defined but nonetheless mandatory homework assignments in high performance arenas—to wit, hedge funds and Google. Members of a hedge fund team sit around a table and each has to present and defend a new way to make money. An empty brain is a quick ticket to the egress. More bizarre is my memory of Google employees who were supposed to come up with original ideas no matter how whacky and report on their progress weekly. Bizarre because a quick Google search doesn’t confirm it. What’s the moral for the self-directed investor or trader? And what’s the takeaway for me? Well, I’m going to try once a week to give a presentation to a group of imaginary sophisticated hedge fund traders. It will be my homework assignment—undoubtedly my most difficult homework assignment ever--and will take me outside my comfort zone. And since I refuse to be laughed out of the room I’ll try to come up with a defensible idea that, minimally, my imaginary colleagues haven’t already discarded and, in the best case scenario, haven’t thought of. Maybe someday I’ll even be brave enough to share my homework with you, my readers. Alas, I can’t manipulate your reactions in my imagination. Mark D. Wolfinger’s book The Rookie’s Guide to Options: The Beginner’s Handbook of Trading Equity Options (W&A Publishing, 2009) is perfect for the investor who is interested in writing covered calls and who might down the road consider some other options strategies. The rookie will still be a rookie after reading this book but, if he heeds Wolfinger’s words, he will not have committed a whole host of costly rookie errors. Throughout the book Wolfinger describes options as more of a risk management tool than an outsized profit center. None of the “make 1256% in 5 days” hype. With any options strategy, he contends, it’s important to ask three questions: What do you have to gain? What do you have to lose? Can the strategy make a significant difference in the profitability of your investment portfolio? (p. 72) Where possible, he provides metrics to help answer these questions. For instance, a comparison of the Buy-Write Index (BXM) to the S&P Total Return Index (SPTR) shows that in wildly bullish times it’s better to own stocks outright. By contrast, in every year during the 1988-2003 period when the market returned less than 22%, BXM consistently outperformed SPTR. It’s worth noting that in the last five years this relationship has broken down. BXM underperformed in 2004, 2005, and 2006, the last year for which Wolfinger provides data. If my calculations are correct, the BMX outperformed in 2007 and underperformed in 2008. In brief, of late the strategy has been a little dicier to execute profitably. Wolfinger acknowledges that covered call writing is not the best options strategy and recommends it primarily as a learning tool. Right here he may have given his best advice for the conservative rookie. I, and I assume most other investors, get countless invitations to investment dinners in which one of the most frequently advertised agenda items is “learn to make additional income month after month with covered calls.” The novice who is tempted to succumb but first wants a little more education might, after reading this book, take one step back. In fact, I would suggest that he try paper trading the strategy to gain a free education and to see whether it fits his risk/reward profile. Wolfinger provides all the basics for this education. He takes the rookie through the steps of preparing to trade, making the trade, and managing the trade. Wolfinger then moves on to collars, which he views as the ultimate portfolio insurance policy. Whether or not one agrees with this thesis, the author serves the novice well by stressing the need to manage downside risk and providing one strategy for doing this. The final basic strategy that he discusses is writing cash-secured puts. Although there are brief accounts of the Greeks and synthetics and although Wolfinger goes on to describe credit spreads, iron condors, and double diagonals, the strength of the book lies in the earlier chapters. He helps the beginner along with quizzes. On a bonus disc, he supplements the reader’s options education with a 25-question advanced quiz, some links, and articles he has written over the years for SFO magazine. In this, my final post on Geoff Colvin’s Talent Is Overrated, I’m going to delve into the mysterious world of memory. My takeaway won’t be so much about theories of memory as about the simple but powerful concept of “chunks,” because I think this has particular relevance for the trader. An initial research finding was that when it came to short-term memory, everyone remembered roughly the same number of chunks, but the chunks were of different sizes. Novices had tiny chunks and masters had large chunks. This resonated with me in a psychologically positive way. I have never been able to get beyond page 2 of any bar-by-bar analysis; I simply don’t process data on a unit basis. Colvin says kudos to me. The difference, he claims, “is much like the difference between letters and words.” Assume that a test subject is shown the thirteen letters l-e-x-i-c-o-g-r-a-p-h-e-r and asked to remember them in the correct order. This is an effortless task for a person who knows the word and a virtually impossible task for the person who doesn’t (we’re good for only about seven letters). If this description is at all accurate, the discretionary trader has to invest a lot of time into his training. He has to be able to distinguish triangles the way Revson could distinguish shades of black. He has to remember a phenomenal number of chunks and know when to call on them in his trading strategy. And he has to be able to defeat Deep Blue (in this case, algorithmic trading) often enough to make a profit. Every Saturday I download the “weekly scoreboard” from the blog Between the Hedges. It summarizes changes in the indices, sentiment/internals, futures spot prices, and the economy. I admit I don’t do much with this information; after glancing at it, I simply save it in case I need it for a study some time in the future. Jack Ablin doesn’t want me to be so lackadaisical. In Reading Minds and Markets: Minimizing Risk and Maximizing Returns in a Volatile Global Marketplace (FT Press, 2009) written with Suzanne McGee, he sets out a five-step plan to improve portfolio performance. Although touted as something that any investor can do, it’s in fact an outline of how Ablin, the chief investment officer of Harris Private Bank, professionally manages portfolios. The average investor simply wouldn’t have the time or expertise to evaluate all the data points Ablin includes in his models. Let me summarize how Ablin, a self-proclaimed quant, puts data to work in managing portfolios. First, the investor has to respect momentum because “trends are much more powerful, resilient, and long-lasting than we like to admit.” (p. 99) How can one know when momentum has shifted? Well, there’s the standard 200-day moving average for looking at individual markets. When comparing one market against another, however, one needs a longer moving average. The 20-month moving average, for instance, would have been useful in predicting when the S&P 500 would start to outperform the Russell 2000. In commodities as measured by the CRB index the 52-week moving average would have been the critical demarcation line. Moreover, the buy and sell rules are not constant in all three cases. In the Dow 200-day moving average study the rule was to buy when the Dow moved one percent above its 200-day moving average and to sell when it dropped one percent below. The rules for commodities are virtually the same—buy and sell when the movement is more than one percent. But when it comes to the relative momentum of large caps versus small caps, the one percent rule becomes a three percent rule. In brief, backtest and optimize. And once that’s done move on to breadth indicators. Since financial markets don’t exist in a vacuum, the investor also has to analyze the economy. Ablin considers the yield curve and the fed funds futures curve to be crucial predictors of the direction of U.S. stocks. But, of course, the investor also has to weigh global economic conditions. The third factor in this investment plan is liquidity as measured by such data as yield spreads, fund flows into closed-end mutual funds, the number of shares outstanding in an ETF over time, and M2. The fourth factor is psychological—greed vs. fear. Here Ablin references the standard sentiment gauges and the NYSE short interest ratio; he also cautions against giving them too much weight, against being an automatic contrarian. The final factor and the lynchpin for any investment strategy is fundamentals and valuation. Ablin’s favorite metric here is the earnings yield model, though valuation quickly becomes much more complicated. To those who complain that there’s got to be a simpler way, Ablin claims that there isn’t; at least, there’s no magic formula for bringing the markets into focus. If Ablin is correct, the do-it-yourselfer is doomed; he’d best give up and hand his portfolio over to a professional money manager. But this do-it-yourselfer will keep on going in the perhaps self-delusional hope that over the long haul with simpler, more targeted systems she will outperform traditional money management metrics. In this, my second post on Geoff Colvin’s Talent Is Overrated (Portfolio, 2008), I’ll look at ways in which top performers perceive more than average performers do. First, where speed is important they improve their reaction time by looking into the future. This is an important point, however absurd it may seem on its face. For instance, in trying to judge where a tennis serve will land, average players look at the ball; the best players look at the opponent’s stance—hips, shoulders, arms—in the instant before the racket hits the ball. This will foretell where the ball will land. In a totally different context, ace typists get an edge by looking farther ahead in the text. Second, top performers grasp the significance of indicators that average performers don’t even notice. Colvin cites the divergence between the rapidly rising sales volume of extra-large clothing and the alleged fitness trend of the 1980s; today the outcome of that divergence is only too obvious. Or they find “reliable” relationships in the financial markets that others have ignored. Third, they know more from seeing less. As Colvin points out, getting information is expensive both in terms of time and money. So it’s a competitive advantage to be able to make sound decisions quickly and cheaply. Fourth, they make finer discriminations. That is, they can see differences that others don’t in the same way that Charles Revson (of Revlon fame) could apparently distinguish several different shades of black. Naturally, acquiring these four perceptual skills requires training and practice. And the training and practice can’t occur in a generic setting such as the Nintendo brain games. A trader has to practice perceiving more in the trading world; the skills he learns are not, in general, transferable to another sphere. As with everything else in trading, there are no well-defined routes to acquiring this skill set. But Colvin defines a goal that far too few traders even contemplate. They practice entries and exits, they practice assuming winning mind sets, but who practices perceiving more? Perhaps the top performers or soon-to-be top performers. Every Friday the CFTC publishes the Commitments of Traders Report detailing open interest in futures contracts as of the previous Tuesday’s close. Both current and historical reports (futures only reports beginning in 1986, full reports in 2005) are publicly available at the CFTC’s web site. These reports supplement material included in standard charting software programs. “Open interest listed in the newspaper, shown on price charts, or downloaded with historical price data includes spreading open interest in the total. [The spreading total] can easily camouflage the state of the outright positions.” (p. 51) The COT report offers traders a separate data set that shows the long and short positions of the reporting commercials (hedgers) and speculators (funds) as well as of the nonreporting small traders. The problem is how to make use of the data to improve an already viable trading strategy or to construct a new trading strategy. Stephen Briese’s The Commitments of Traders Bible: How to Profit from Insider Market Intelligence (Wiley, 2008) is a useful guide—clearly written, easily understood, and informative for anyone who either swing trades or position trades futures. He debunks such myths as “always follow commercials” and “always fade the small speculator.” The second myth, by the way, is false because the “nonreportable positions” column in the report includes both small commercial hedgers and small speculators and there is no way to separate one from the other. He shows how he calculates the COT Index and the COT Movement Index and offers some trade setups. And he looks at the peculiarities of the individual futures markets. It’s difficult to extract one or two nuggets from this book as I often do in my blog posts. The most valuable information cannot be summarized in a paragraph. Sorry, but this is one of those junior high book reports that ends with “you have to read the book.” Briese has a website for readers of his book: CommitmentsOfTraders.ORG with free “cleaned up” COT data (current and historical) and regularly updated COT charts. Geoff Colvin’s Talent Is Overrated (Portfolio, 2008) overlaps at many points with Brett Steenbarger’s Enhancing Trader Performance (2006). Both offer enlightening analyses of performance; the trader would do well to read them both. I’m going to focus in this post (and a couple of planned posts) on insights from Colvin’s book. I suspect that, even though Colvin is senior editor at large for Fortune magazine, this book may never have made it to the reading lists of traders and investors. With children and adult novices the initial motivation is frequently external. Parents set a practice schedule, for instance. Beginning traders may want to leave their dull 9 to 5 job or may need to pay some bills. But at some point in the development from tyro to master the drive to excel starts to be internalized, thus sustaining the passion. It’s possible that this is in part the result of the multiplier effect which, in one iteration, says that simply telling someone that her performance is excellent, despite its actual quality, might motivate the extra practice that then leads to improved performance, attracting more praise. Here’s an area in which traders might help each other out, since it’s hard to keep up positive self talk in the face of less than masterful performance. At an elementary level I think this analogy is sound (though in a future blog I’ll invoke Geoff Colvin to add to it), which is why I, who reads and deletes at a speed that might challenge an ADHD teenager, saved his post. But I would offer one minor qualification and one major caveat. The qualification is that muscle memory comes from doing, not just “staring,” a point I’m sure scalperscott would agree with. You can burn a pattern into your brain, but it has to be in your fingers as well. The caveat is more challenging. Most of the time when we’re acquiring muscle memory (especially when it involves more than what the vast majority of people achieve—to walk, for instance) we’re helped along by a teacher. If the teacher is good, we get a solid grounding and master the basics. Then we may be able to practice, practice, practice our way to Carnegie Hall. If, on the other hand, the teacher is middling to bad, what we learn doesn’t give us the foundation for future success. We can practice all we want, but if the fundamentals aren’t in place we’ll never get past amateur status. In trading, alas, there are no accepted basics. The novice trader doesn’t start with scales and then move up to arpeggios. (It’s obvious I can’t continue the martial arts comparison.) She can’t ease herself into trading the way the John Thompson books eased a child into playing the piano. And since there are no accepted basics (and I don’t count trading truisms such as cut your losses short and let your winners run as basics because they’re incredibly difficult to execute) and no standard paths to mastery in trading, the whole teaching model breaks down. And that might seem to put the muscle memory analogy at risk when it comes to trading. But let’s go back to the baby learning to walk. He doesn’t have a real teacher, though often he has helpers or cheerleaders. He simply tries to walk, falls, tries again, falls again, eventually walks more than he falls, and finally through lots and lots of practice he walks easily and without thinking about it. This is a process that almost everyone has gone through, presumably without psychological scarring. By the time we get around to trying our hand at trading, however, we are no longer used to all this trial and error, the seemingly endless cycle of failure. We want to be taught mastery one lesson at a time. We want to learn to trade the way we learned to play the piano. We want tiny successes to become larger successes; we don’t want to keep stumbling. This may be one important reason that, although almost everyone can walk and many people can play the piano well, so few are even marginally profitable traders. Most readers of this blog are probably too advanced in their investing and trading strategies to profit from Russell R. Wasendorf, Jr.’s The Secret Keys to Smart Investing: Simple Strategic Rules to Diversify and Maximize Your Investment (W&A Publishing, 2009). But they might consider giving this book as a thoughtful present to a friend or relative. Wasendorf’s intended reader is the person who owns his own home, has a 401(k) or IRA invested in stocks, and has rainy-day cash. Moreover, after investing the maximum each year in tax-beneficial funds, he also puts some money into taxable investment accounts. And then comes the “secret ingredient.” He switches a small portion of his assets into alternative investments that seek out-sized returns and that are uncorrelated with the rest of his portfolio; this will improve the efficiency of his portfolio. That is, they will smooth out portfolio volatility and perhaps increase returns. Among the alternative investments Wasendorf considers are collectibles, metals, currencies, commodity futures, and options. He outlines the many pitfalls of investing in collectibles, and he suggests that there are better alternatives to investing in metals than hoarding bars, ingots, or coins. He warns the reader of the presence of disreputable dealers in the forex market. And he urges the investor to seek alternative investments that are regulated, transparent, liquid, and reputable—in brief, futures and options. Wasendorf then offers the reader a primer in these two types of alternative investments. Not surprisingly, since Wasendorf’s father is the founder, chairman, and CEO of PFGBEST, and the author is the president and COO of the firm, he makes a pitch for managed funds. PFGBEST is a brokerage firm that has expanded beyond its flagship product—futures—into forex and options trading. And, as it says on its website, its trading professionals “have created blended portfolios that are customized and managed to meet the great demand for diversification and enhanced return strategies.” But this book is not just a very long ad for the company; it is an extremely readable guide for the person thinking about including alternative investments in her portfolio. Katinka Hosszu of Hungary recently outswam Zimbabwe’s Kirsty Coventry and Australian Olympic champion Stephanie Rice to win gold in the women’s 400m individual medley at the world championships. And this bit of news, you ask, belongs on a blog about trading and investing? Bear with me. Thanks to the good offices of a journalist friend in Hungary and a Hungarian-American blogger I got a translation of relevant snippets from an interview she gave after her victory. It speaks to the transition from competence to world-class performance. Here I’ll simply share the interview; readers can draw their own parallels to trading. By way of background, Hosszu left Hungary a year ago to attend the University of Southern California. In the 2008 Olympics she was 12th in the 400m IM. Reporter: What happened to you in the United States? One can see a big change. Hosszu: Well, that’s a long story. We talk now as if I started to swim a year ago. My grandfather taught me to swim and very well. So I have him to thank for my good technique, the foundations. . . . Then last September I went to the United States. I got tired of training at home. Often I swam alone, but when I went to the United States I became part of a team. I wasn’t even thinking of the goals. Rather, I went to train because I enjoyed it. Because I like to swim and it was good to be with the others. Reporter: Did they plant some kind of positive thinking in you? Hosszu: Yes, my attitude has changed completely. For instance, before the 400 meter medley I didn’t think for one minute about not doing well. Reporter: Prior to that you did? Reporter: And now that’s completely over with? Hosszu: Yes, completely. There is no such thing as doing badly. I was in the finals of a world championship and even if I had been number eight the very fact that I was there, among the best eight, was already an achievement. In general in the United States I think positively. Reporter: Is it true that your coach calls you Miss Rice? Hosszu: No, he calls me Rice Cooker. For a long time he has been telling me that I have to eat Rice for breakfast. Reporter: So he wanted to motivate you because of Stephanie Rice. Wasn’t she your most dangerous opponent in the 400 meter medley? Hosszu: Yes, it was a reference to her name. It was a pun. A potentially fruitful trading idea worth sharing: Brett Steenbarger's post entitled "Changing Our Lenses and Finding New Opportunity." As options trading has become increasingly popular, the number of books on options has proliferated. Ron Ianieri’s Options Theory and Trading: A Step-by-Step Guide to Control Risk and Generate Profits (Wiley, 2009) will undoubtedly become a standard against which introductory texts are measured. Beginning with options basics and theory (pricing models, the Greeks, and synthetics), Ianieri moves on to strategies. He is writing for the novice; for instance, more than halfway through the book he reminds the reader that “bullish” means to have a positive outlook on a stock’s future movement. But even more seasoned traders can profit here and there from this book. It also has a place in the trader’s library as a reference book that can offer a quick refresher course as needed. Ianieri is to be praised for spending thirty pages on synthetic positions. Although there no shortage of literature on synthetics, much of it falls into one of two camps—too abbreviated or hopelessly convoluted. In his discussion of synthetics, as throughout the book, Ianieri in effect targets the “C” student, the one who needs to have things clearly explained in multiple ways (the general, the specific, charts, figures, and tables) and who benefits from repetition and highlighting. Since in the world of options the novice is at best a “C” student, his educational strategy is spot on. Even the “A” student can profit because Ianieri doesn’t oversimplify; the “A” student can just read a little more quickly. Ianieri covers the following strategies: covered call/buy-write, covered put/sell-write, protective put, synthetic put/protective call, collar, vertical spread, time spread, diagonal spread, straddle, strangle, butterfly, and condor. In each basic strategy (covered calls through collars) he lays out the foundation of the strategy, its performance in different scenarios, the lean (bias), gives examples and finally a synopsis. Where appropriate he also discusses rolling the position. His discussions of advanced and combination strategies break out of this structural mold, but they are still lucid and methodical. Options Theory and Trading is not just a book about options, it’s a course on options. Ianieri is not only a writer but a teacher. The reader who doesn’t understand options by the time he finishes this book should look for a new instrument to trade. Can a trader successfully rebrand herself? I would never have contemplated this topic had I not discovered, long after I first watched the brilliant ads, that Ally Bank is in fact the old, tainted GMAC. Rebranding is essentially a marketing strategy, so for the independent trader it might seem an utterly irrelevant concept. But think of it this way. Rebranding doesn’t happen only in the advertising agency; the business itself has to change to embody the new image. In the case of rebranding to get rid of previous negative connotations, the business has to make sure that the reasons the old brand was stigmatized don’t attach themselves to the new brand. It’s not enough to change the company’s name from Evil Userers to Friendly Lenders if the usurious policies remain in place. If the company is rebranding to move a product upmarket (Joe’s Stink Cover-upper to Acqua di Parma Colonia Deodorant Stick, “a blend of jasmine, amber, and white musk” available at Neiman Marcus for $33) it has to change its own self-image. Let’s imagine some rebranding ad campaigns for traders. Now the closest I got to ad writers was riding up and down in an elevator for a year with some of the best and the brightest in the ad world who never shut up, but since I was working for an educational foundation, I didn’t pay a lot of attention to their constant chatter. It goes without saying that my ad campaigns aren’t going to win any Clio awards. Case #1: The business was formerly known as “Victim of the Freight Train.” Its strategy was to pick tops and bottoms in the market. Well, that didn’t work out too well, but fortunately the business didn’t go bankrupt. So it can rebrand itself, perhaps simply changing its name to “The Freight Train.” What kind of ad campaign could it run? Something based on friends, though I don’t think that even the best ad agency could mount a friendship campaign for a company called The Freight Train. That minor problem aside, consider an ad that says “I’m your friend [unspoken line: until I’m not]. I want to walk with you, run with you, blah, blah, blah.” Upshot: The revamped business model will pay attention to the power of trends. Case #2: The business is called “Stuck in the Mud.” Even though it makes money, it doesn’t make a lot of money. It always trades one lots. What if it were temporarily rebranded as “Eaglet Trading,” with the intention of eventually dropping the “t” from “eaglet”? That’s a definite shift in image. The business will soar, it will have the keen eyesight necessary to see trading opportunities, and it will seize those opportunities, picking some carcasses clean. So here’s an exercise for those moments when the market is dull. If you had to give a descriptive name to your current trading business, what would it be? If you decided to rebrand, what would the new name be? What kind of imaginary ad campaign would you mount? And how would your business have to change to embody the new image? Commenting on my July 11 review of Jankovsky’s The Art of the Trade, Jorge mentioned another Jankovsky book, Trading Rules That Work: The 28 Essential Lessons Every Trader Must Master (Wiley, 2007), that he found “a much better book.” I’ve finally gotten around to seconding his opinion. Trading Rules That Work is a very good book for the novice trader, but it probably has even more value for the trader with some experience. A couple of links for those who like to keep track of asset performance. First, The Chart Store, a subscription-based service that has over 5,000 charts and that offers as free samples a weekly scoreboard and a monthly scoreboard of major U.S. stock indexes, interest rates, commodities (spot), and currencies. The weekly scoreboard shows the change for the week, year to date, and from 52 weeks ago in $ and in %. The monthly scoreboard shows percent change for the month, the last 3 months, the year to date, 1 year, 2 years, 3 years, 5 years, and 10 years. Second, the World Bank publishes annual, quarterly, and monthly averages of commodity prices--the so-called pink sheet. It is issued monthly. How time flies when you’re having fun! I still have the first edition (admittedly revised) of William J. O’Neil’s How to Make Money in Stocks: A Winning System in Good Times or Bad on my shelf. The book is now available in an updated fourth edition (McGraw-Hill, 2009), and it’s about twice as long as the first edition. One reason for the increased length is that this edition includes 100 charts of the greatest winners from 1880 through 2008. O’Neil is, of course, the founder of Investor’s Business Daily, a paper best known for its “SmartSelect” corporate ratings—in particular the relative price strength rating. He is also the developer of the CAN SLIM trading method, detailed in this book. Despite the fact that over two million copies of this book have been sold since it first appeared in 1988, the CAN SLIM method apparently hasn’t lost its edge. Note, however, that the CAN SLIM Select Growth fund from Fidelity—CANGX—has had a pretty mediocre record since its inception in 2005; I don’t know whether this reflects on the method or the managers. The fact that at last report they had almost 14% of their holdings in index ETFs (small cap, mid cap, and large cap) might explain why they have had a hard time beating the S&P 500. 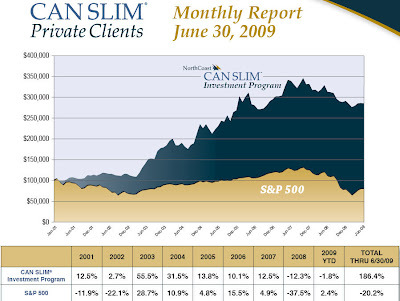 The chart below reflects the fund’s performance as of 6/30/09. CAN SLIM Private Clients, managed by the same firm responsible for the Fidelity mutual fund, reports the following much healthier returns. Whatever the case, O’Neil’s book has always been a sound starting point for the active investor willing to combine fundamental and technical factors to search for stocks that can outperform the market. It belongs on every investor’s shelf. Today I want to focus on the paradox of the efficient market because the authors offer an interesting twist on it. Basically the paradox claims that the efficient market hypothesis is true only if enough investors believe it to be false. If everyone believed in market efficiency no one would try to discover inefficiencies. “In such a world, price changes would slow to a crawl or cease because there would be no one who would believe that it is wise or prudent to pay anything other than the market price.” New information would not be incorporated into a stock’s price, so the market would become less responsive and hence less efficient. Extracting two paragraphs from a 466-page book is, of course, a sorry excuse for a review, but take them as illustrative. This book is a treasure trove of insights for anyone interested in performance metrics, especially benchmarked performance metrics. The first part of Carl Futia’s The Art of Contrarian Trading: How to Profit from Crowd Behavior in the Financial Markets (Wiley, 2009) is quasi-theoretical; it is a well researched, tightly written analysis of investment crowds. The second part is practical—how to make money being a contrarian. Since I’ve always been more attracted to the “why” than to the “how,” it’s no surprise that I found the first part of the book more compelling than the second. The one deadly mistake a contrarian can make that will lead to underperformance of the buy-and-hold strategy is to be out of or short the market when it is rising. And yet novice contrarians tend to commit this very mistake. Futia suggests that since it is much more difficult to ascertain when the market is overvalued than when it is undervalued, the novice should focus his attention on periods of undervaluation. How does the contrarian go about figuring out market mistakes? Futia relies mainly on his media diary (including magazine covers and headlines), secondarily on the distance of the S&P 500 from its 50 and 200 day moving averages. He offers strategies for both conservative and aggressive contrarians using mostly broad market ETFs. In 1990 Richard H. Thaler and Eric J. Johnson wrote a paper entitled “Gambling with the House Money and Trying to Break Even: The Effects of Prior Outcomes on Risky Choice” (available for download at the Social Science Research Network). The paper focuses on how risk-taking behavior is affected by prior gains and losses. It definitely has repercussions for the trader and investor. There is no need to summarize the authors’ theoretical work here. But their experiments led to three important empirical results. First, how do people respond to the chance to gain back some of their money after a loss? For instance, the subject had just lost $30 and was asked to choose between (a) doing nothing and (b) a gamble with a 50% chance to win $9 and a 50% chance to lose $9. Sixty percent of the subjects opted to do nothing. The implications for the trader are obvious. First, it goes against the grain to pull the trigger after a losing trade and, by extension, after a string of losing trades (even when following a well-researched system) it requires an almost superhuman effort to take that next buy or sell signal. Second, winning traders get cocky because they no longer see themselves as playing with their own money. How many times have we read “move your stop to break even, then you’re playing with the house’s money.” The third result has two incarnations: the revenge trader who throws caution to the wind in his attempt to break even and the penny-wise and pound-foolish trader who is seduced by the siren call of out-of-the money, long shot options. Many of the indicators described in Cynthia A. Kase’s Trading with the Odds: Using the Power of Probability to Profit in the Futures Market (McGraw-Hill, 1996) are now available in the public domain for popular charting programs such as MetaStock, TradeStation, eSignal, Ninja Trader, CQG, and Aspen Graphics. The most intriguing indicator to my mind is what she calls the Kase Dev-Stop, and today I want to spend some time looking at its rationale. Kase set out to improve on the standard volatility-based Chandelier trailing stop. This stop was normally calculated by multiplying a stock’s average true range (ATR) over a given period by some constant. For example, let’s say the 10-period ATR is 0.5 at the time of entry and the multiplier is 3. The trader is long XYZ with an entry at 20. The stock moves up to a closing high of 22 but then starts to pull back. If volatility remained constant during the course of the trade, the trader would be stopped out when the stock closed below 20.5 [22 – (0.5*3)]. If, however, volatility increased to 0.75, the trade would have more breathing room; in this case the stop would move down to 19.75. One problem with this trailing stop method, Kase argues, is that “the level of noise is variable. This variability is not captured by an average, but by the standard deviation around the mean.” (p. 95) For the statistically challenged, Kase compares the height profiles of two different populations. The first group is made up of chorus line dancers; the second is an assortment of preschool children and basketball players. Let’s assume that we want to figure out how high a doorway would have to be so that 97.5% of each population could pass through without ducking. If the average height of the chorus line group is 5’7” and the standard deviation of the population is one inch, the door would have to be a little higher than two standard deviations above the mean—that is, a little higher than 5’9”—for 97.5% to pass through. In the second case the average height of the group is the same 5’7”, but the standard deviation is five inches. So the door would have to be 6’5” to accommodate the same 97.5%. To use the Dev-Stop Kase first draws a warning line, which “reflects the average two-bar reversal against the trend. The second, third, and fourth lines reflect one, two, and three standard deviation moves against the trend, corrected for skew.” (p. 97) Kase herself normally concentrates on the line that represents a three standard deviation retracement, though during highly volatile periods or if “in a profit-taking mode,” she will exit at the one standard deviation line. The Aspen Graphics site, by the way, has a chart that displays Kase Dev Stops; it also describes possible uses for these stops. When I have some time I’ll test out Kase’s stop against the standard Chandelier stop to see whether it makes a positive difference to the bottom line. Readers can, of course, undertake this task themselves. I realize that the second link isn’t exactly coming to you at twitter speed, but here’s a heads up on a new way traders are getting information and the algo guys are measuring sentiment. The Wall Street Journal today, in its article “For Traders, Twitter Is One More Trading Tool,” looks at how traders in agricultural commodities are using Twitter. StreamBase Systems is a software company that allows its users to analyze tweets in real time to inform trading decisions. We’ve finished another month in the markets, so perhaps it’s time to reflect on some long-term performance metrics for stocks, bonds, commodities, and currencies. This data is compliments of The Chart Store. Over the past ten years, the best performer as measured by its annualized percent change was the Gold Bugs Index (HUI) at 18.32%. By asset class commodities were the clear winners. Energy commodities, with the notable exception of natural gas, gained 12-13% on the spot market. Industrial metals (copper, lead, nickel, and tin) were up between 11 and 14%. Gold was up 14%, platinum 13%, and silver 10%. Grains were all positive with gains between 7 and 10%. Among the softs sugar did best at 12%, cocoa next at 10%, coffee eked out an almost 2% gain, and cotton was fractionally negative. Bonds, as measured by the Ryan Index, returned 7% at the long end of the curve and 3.3% for the 3-month Treasury. The strongest currency was the Canadian dollar at 3.41%, the weakest the Mexican peso at -3.32%. And then there were the stock indexes. Measured by price only, not total return, the Dow Jones Industrial Average lost 1.49%, the S&P 500 lost 2.92%, and the Nasdaq Composite lost 2.84%. By cap size the winner was the S&P 600 SmallCap (+4.87%) and the S&P 400 MidCap (+4.42%). Looking back two years, where would we have done best? We could have earned handsome returns by being very selective in commodities (soybeans, gold, cocoa, sugar) but would have suffered double-digit losses if we had invested in the industrial metals, in palladium, in natural gas, or in wheat. Bonds chugged along with returns between 2.65% and 8.99%, and the Japanese yen gained over 12%. All stock indexes with the exception of the Dow Jones Utilities Average fell double digits. There are mighty few bright spots over a one-year time frame. Sugar is a stand out, up over 25%, the Japanese yen gained over 14%, and the U.S. Dollar Index was up almost 7%. Bonds held their own (though year to date the 30-year Treasury has cratered). Otherwise most of the stock indexes lost in the neighborhood of 20%, with the Nasdaq 100 best at -13% and the Dow Jones Transportation Average worst at -29%. The energy complex got hit hard, with one-year losses between 36% and 63%. The grains fell between 22% and 38%, about half of the industrial metals fell 30+%, the precious metals with the exception of gold (up 2%) fell between 22% and 33%, and the softs were all over the map (cocoa essentially flat, coffee and cotton down double digits, and sugar up 25%). A lot of currencies also took it on the chin—double-digit losses for the Australian dollar, the Brazilian real, the British pound, the Indian rupee, the Mexican peso, the South Korean won, and the Swedish kronor. Since I’m not pretentious enough to classify most of my ramblings as “bright ideas,” I’ll label them thought bubbles. Here’s the first. Trading is often compared to golf (in many cases by those who are both traders and amateur golfers) and the super trader to the likes of Tiger Woods. Although trading is for the most part an individual endeavor, although I suppose one can liken the variability of market conditions to the variability of golf courses under different weather conditions, although both activities require extensive practice and mental conditioning, I nonetheless find the comparison wanting. Let me state for the record that I find golf boring and trading fascinating, so I’m biased. Here goes anyway. The competitive golfer has a simple goal—to finish in fewer strokes than anyone else in the tournament. Each entrant pursues his goal independently of the rest of the field. It’s similar to taking a test and trying to get the highest grade in the class. The other golfers can’t interfere with his pursuit; golf isn’t croquet where a player gets points for hitting another player’s ball. By contrast, most traders participate in a double auction system with innumerable interacting buyers and sellers. Every trader, from the one-lotter to someone on the prop desk of a major investment bank, affects every other. It may seem intuitive that big-time traders make more of an impact than the little guy—and probably 99.9% of the time they do, but think back to the analogy of the unstable pile of sand where adding a few more grains may barely matter or may make a huge difference (Mauboussin, 7/13/2009 blog). Even with inside information it’s impossible to know with certainty what the ramifications of the actions of any single trader or group of traders are, but we can say with certainty that in such a dynamic system there are ramifications. Intentionally or not, each trader interferes with the pursuits of other traders. The golfer who thinks about what his competition is doing before taking his shot will probably psych himself out. On the other hand, the successful trader—whether systematic or discretionary—has to have a sense of what other traders have been doing in the immediate past, predict what they most likely will do in the near future, and estimate what the results of their actions will be. Otherwise, he can’t decide whether to dip his toe into the water, to become more aggressive, to go on the defensive, or simply not to play.